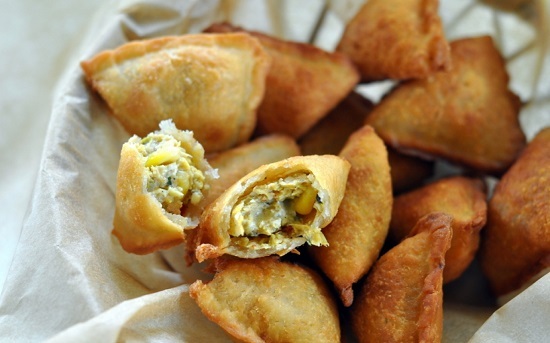 To begin making the Corn & Paneer Baked Samosa Recipe, mix the flour and the salt well together. Soften the butter or ghee and combine into the flour and mix using your fingers. Preheat the oven to 220 C. Grease an oven dish with 1 tablespoon Oil or Butter. Repeat the same process of shaping and filling the samosas with rest of the dough. Place samosas on greased oven dish and bake at 220 C for 15-20 minutes until golden brown or if you wish deep fry them till golden brown. The Corn & Paneer Baked Samosa Recipe is one of those dishes that make a perfect tea time snack for the monsoons. With monsoon here we are all craving for street foods and I love to make these healthier version of samosa which are stuffed with corn and paneer. Apart from the flavors that the Corn & Paneer Baked Samosa comes with, this recipe is a non fried version making it healthy too.